This past weekend, I was at a party in Philadelphia, in a small house between University Heights and the ghettos to the west, an area where you never know who you are going to meet. As it happened, I met Amanda, an activist who is involved with the Occupy movement, and I noticed the shirt she was wearing. 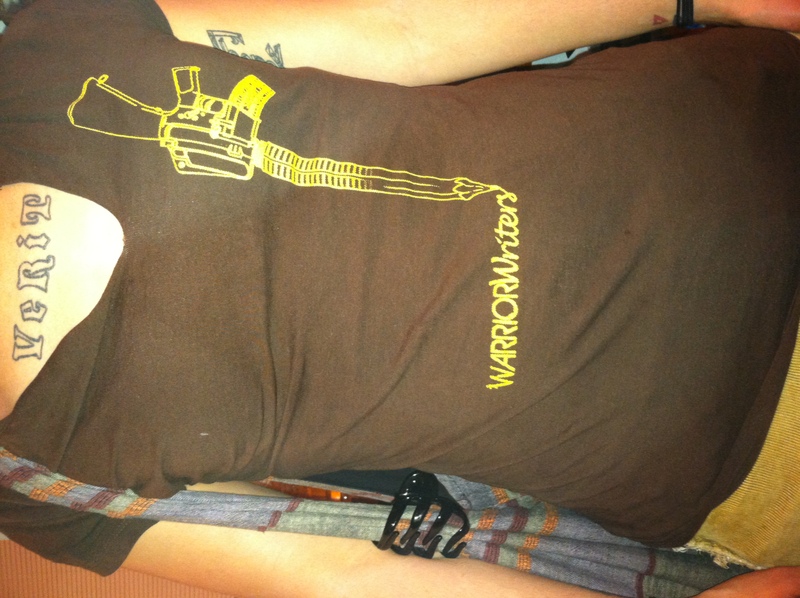 As you see, it has a picture of an assault rifle, but the business end of the rifle is a pencil point, and it is writing “Warrior Writers”. My first thought was that it represented a group of writer-activists, and that it implied something along the lines of the pen is mightier than the sword. But when I asked Amanda about it, she explained that it is a group for war veterans, and they write to repair the damage that war has done to their hearts, souls, and minds. That’s war’s dirty little secret that is finally out in the open. We no longer talk about shell shock or combat fatigue as something that only effects a few soldiers. Since Vietnam, we pretty openly acknowledge that war wounds everyone it touches, vanquished and victors alike; it blasts holes in the tender and important parts of everyone, even those who never bleed actual blood. So, this encounter reminded me of a conversation I took part in a few weeks ago. I was talking with two friends, a man who is probably about ten years younger than me, who has a small business and devotes a lot of time and energy to volunteer work in the community. The second friend is a soldier in the army reserves, an MP who will soon be posted to the prison at Guantanamo. She’s a young woman of nineteen who loves children, loves Jesus, and does a lot of volunteer work, a woman with a heart as big as an ocean. Somehow, the subject of torture came up. The guy said he has no problem with water boarding people; he is in favor of it. The soldier said that she has no problem with it, either, and would do it if she was ordered to. I was shocked hearing it from her, and said so. They both insisted that it is necessary to keep us safe. I replied that the truth is that torture is ineffective, but that that is irrelevant; it’s wrong, we have always regarded it as unthinkable, and we must remember who we are. I didn’t change any minds. –I’m also a soldier. I follow orders. -Illegal orders? You know that torture is forbidden by the Army Field Manual? And that you are under orders to refuse illegal orders? -I do what I’m told. To her credit, she looked uncomfortable as she said these things. But do you see how pervasive the ruin of war is? How it eats holes in the souls of those who haven’t even experienced it, but must contemplate it? The devastation of war even reaches to the hearts of ordinary citizens, who become willing to contemplate and do the unthinkable. On the other hand, why fault people for accepting that torture be done in their name? Once we have accepted the large-scale public horror that is war, why not accept the private, personal horror of the water board? What stands between them but centuries of law and tradition? All horror is personal; all war is horror. Coming soon to a blog near YOU: The Hunger Games Trilogy! This entry was posted in Books & Poems, Something I Read and tagged Christianity, friends, Jesus, love, peace, The Hunger Games, war, writing. Bookmark the permalink.